Meals are simply combinations of foods that are created in order to simplify the process of entering the food items individually. Any time you eat the same type of meal, such as a salad or a sandwich, that consists of multiple food items, then that is a good candidate for creating a meal. Once you create a meal, you will be able to enter each of the foods associated with that meal to your nutrition log with a single click of the mouse. The data for your meals is the total of all the individual foods that make up that meal. 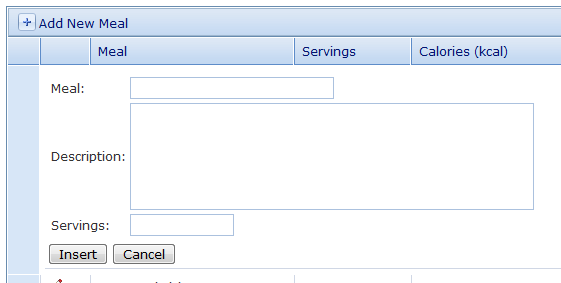 Click the 'Add New Meal' link to create a new meal. From there you can enter the name of the meal, which is what will show up on the meal drop down box on the nutrition log entry page, an optional description, and the number of servings in the meal. Click the 'Insert' button to save the meal. Once the meal record has been saved, you must now add foods to your meal. 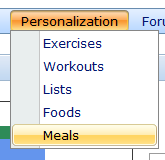 If you do not add foods to the meal, nothing will happen when you select the meal on the nutrition log entry page. The grid will automatically expand and be in insert mode once you save the meal. To add foods to the meal, just type in the food you are looking for into the drop down box and you will be shown all the foods in the database that match your search along with key nutritional values. You can hover over the magnifying glass icon to get a view of the full nutritional label. Once you find the food you want to add, select it and enter the number of servings of that food for your meal, then click the 'Insert' button. Click the 'Add New Food to this Meal' link to add as many foods as necessary to complete the meal. 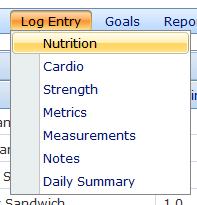 To create a nutrition log entry with the meal, navigate to Log Entry -> Nutrition. Click the meal drop down box and select the meal you just created. Enter the number of servings you consumed and click the 'Load Meal' button. The nutritional data will be calculated automatically based on the serving size of the meal and the number of servings consumed. So, for this example, the Spring Salad meal was create with a serving size of 2, but logged as 1 serving consumed. Therefore, the serving size of the individual foods are cut in half.